Declaring that I have one favorite cookie seems like a daring and potentially deceitful assertion; after all, there are so many tempting varieties to devour.Being a chocoholic, I do like the hallmark cookies,chocolate chip and Oreo. But I've to admit Turkish Sesame Cookies with nutty sesame seeds , pistachios and honey are my personal favorite.I make them regularly and end up eating more than my boys(They favor chocolate).Who ever I shared these with always loved it and asked for the recipe.Hence these cookies were apt for Noor's of YaSalaam Cooking , My favorite cookie recipe celebration. If you love the flavor of honey and nuts ,try these and see if it becomes one of your favorites as well. In bowl mix toasted sesame seeds with honey. In another bowl whisk eggs, butter,milk and sugar together, until light and fluffy. Sift the flours,baking powder ,soda and salt. Stir this in to the egg mixture and mix thoroughly until the dough comes together,add more milk if needed. Knead for a minute and wrap and allow to rest in refrigerator for 30 minutes. Spread some all-purpose flour on work surface and roll the dough using a rolling pin. Using a round cookie-cutter , cut and lay on a cookie sheet. Now spread honey sesame mixture on top of each of the cookies.Bake for about 15 minutes, or until lightly brown.Cool on rack and store in air tight container. 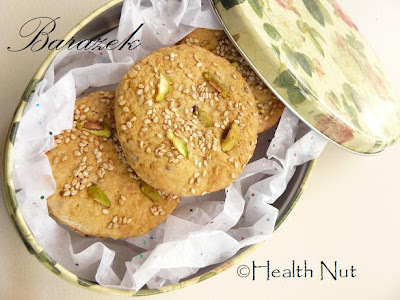 I love pistachio, these cookies look very yummy! Just eyecatching cookies, great gift! Lovely Yasmeen and really ur cookies are enticing.I love these cookies that are easy on the waist and not loaded with calories.Simple awesome. They look fabulous! 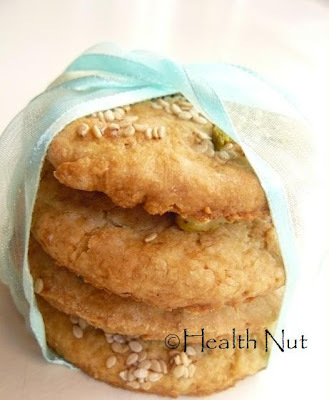 It's impossible not to like cookies that are made with sesame and pistachios! cookies look yummy. Love the ingredients. Nice recipe. My goodness..those look tempting. The pictures are beautiful. These cookies look amazing. I love the idea of combining the pistachios and seasame seeds together. Yasmeen, you have a beautiful blog with lovely collection of recipes. your cookies are worth trying. will soon hop back. very very beautiful presentation yasmeen! This looks so pretty esp, the second pic, cookies peeking out from the piece of cloth! Now it is my favorite as well!!!!!Mmmmmmmm!! I love the way you wrapped the cookies. you have a lovely blog and all the recipes and pictures are quite tempting.